If it's a component maker, and it's small, you're better off staying away. Here's why. 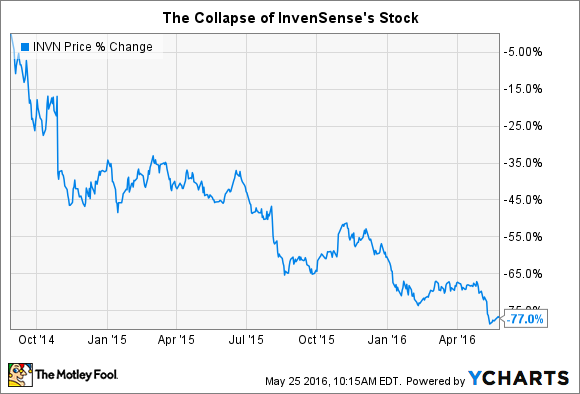 InvenSense (NYSE:INVN) seemed like such a promising stock. The company was a pioneer in micro-electrical-mechanical systems (MEMS) -- chips that can sense movement and apply that movement to technology. The first major application was in Nintendo's Wii remote controllers. With smartphones being the obvious next-in-line application, it seemed like demand for InvenSense's chips would go through the roof... as would its stock. But that's not how it played out. The company relied too heavily on two customers for the bulk of its revenue. But more importantly, competitors like STMicroelectronics offered technology that, while not the exact same, was cheaper and good enough for end users. That put significant pricing pressure on InvenSense. This simply serves as a case study for the No. 1 reason I hate a certain subset of technology stocks: The risk of commoditization is always just around the corner. Perhaps the most important trait for any company you buy shares in is its competitive advantage. Amazon, for instance, has a massive network of uber-expensive fulfillment centers throughout the country. For a competitor to match this scale, it would have to spend mountains of cash and operate at a loss for years before it could even imagine promising easy two-day delivery. LinkedIn, on the other hand, benefits from the network effect. With each individual user that signs on, companies have more motivation to seek potential hires on LinkedIn -- which motivates more users to sign on to the service, and so on. It's a virtuous cycle. When it comes to technology component makers, however, the advantages are much weaker and more tenuous. In the case of InvenSense, there's always the protection of intellectual property patents. But that protection can only go so far. As STMicroelectronics has shown, a competitor can develop its own technology that accomplishes the same end goal without violating any real aspects of intellectual property. And that's where the threat is, especially for investors who don't have deep knowledge in the specific technologies they are investing in. There's no telling where competition will crop up, but if its product achieves the same end goal, end users want the cheapest possible option that will still get the job done. Usually, they are smaller companies -- with a market cap of under $10 billion. They are first movers in new technological applications. At the beginning of their run as public companies, they often rely on a few customers for a bulk of their revenue -- creating another risk for investors. Ambarella (NASDAQ:AMBA) would be another textbook case. The company was first on the scene in systems-on-chips (SoC) technology for video capture. Buoyed by its relationship with camera maker GoPro (NASDAQ:GPRO), its shares soared after going public in 2012. But things haven't been the same since. Like InvenSense, Ambarella's over-reliance on one customer (GoPro) put it in a vulnerable position. But more alarmingly over the long run, rivals with much deeper pockets -- Intel and Qualcomm -- are entering the field. While Ambarella has just over $300 million in cash, Intel and Qualcomm have $15 billion and $16 billion, respectively. And therein lies the problem. Well-heeled rivals can develop their own technology and offer it up at cheaper prices to capture market share. As long as it functions equally well, end users -- like GoPro -- are almost always going to pick the cheapest option. That's why I avoid technology component makers -- and particularly ones with less cash on hand -- like the plague in my own portfolio.